This one won’t last! Popular Spyglass model with two bedrooms, two baths and a separate den/office. This home is well maintained and has a spacious kitchen with pantry, stone counters and breakfast bar that is open to the family room. Built in niche in family room is great for decorating. Plantation shutters on windows throughout with a slider and large windows looking out on the resort like back yard. Tiled patio with water feature, mature landscaping and lots of room for entertaining or relaxing with your coffee and favorite book. The master suite has patio access, dual vanities, walk-in closet, shower and separate water closet. 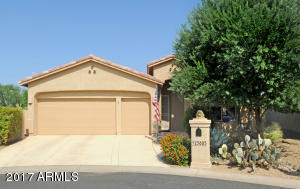 This home is situated on one of the largest lots on Sunny Side and is convenient to the Oakwood Lakes entry/exit gate. Lemon, lime & orange trees too!